MANCHESTER, England (AP) — Manchester City is chasing more records now the Premier League title has been wrapped up. A 5-0 win over Swansea got the champions closer to a few of them. 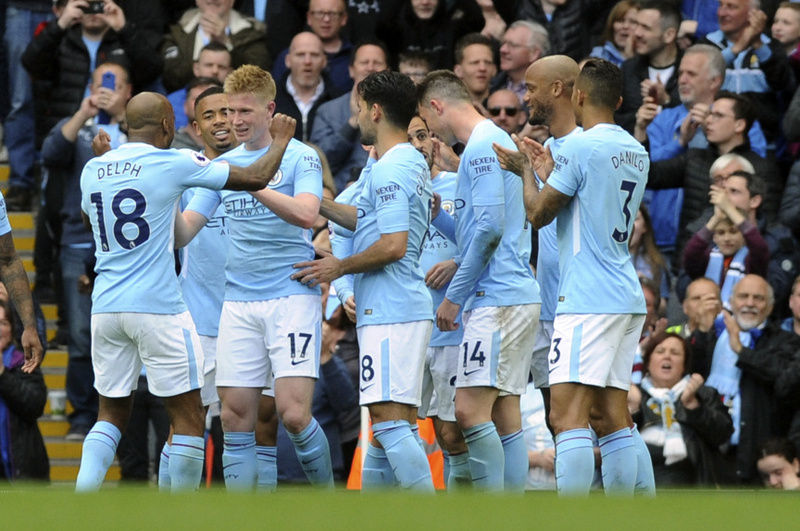 David Silva scored one goal and set up another for Raheem Sterling in the first half, before further strikes by Kevin De Bruyne — a thunderous 25-meter effort — Bernardo Silva and Gabriel Jesus sealed an easy win for City amid a party atmosphere at Etihad Stadium on Sunday. After the final whistle, thousands of City fans came onto the field to mob the players and sing songs, continuing the celebrations a week after the team clinched a third league title in seven years with a record-equaling five matches to spare. It was good-natured but will still likely result in a charge by the Football Association. "No problem," City manager Pep Guardiola said when the prospect of sanctions was raised. "Football is an emotional game. I understand you have to be careful, but when they feel they want to share that they are happy, it is better they stay where they should stay, but I'm not going to tell them don't do that. "If they are happy I like to be close with the team." Having already won a record 18 straight games this season, City is within reach of more milestones to underline one of the most stunning seasons in English soccer. With four games left, City needs six more points to post the most points outright in a Premier League campaign, six more goals for the most goals in a Premier League campaign, and two more wins to post the most victories in a Premier League campaign. Its current goal difference of plus 73 is two better than the all-time best, Chelsea's 71 in 2009-10. The biggest title-winning margin is 18 points — by Manchester United in 2000 — and City's current lead over second-place United is 16 points. More displays like that of David Silva against Swansea and those records will easily be caught. The Spain playmaker was the conductor-in-chief on a day City's players were given a guard of honor as they walked onto the field and were serenaded with songs throughout the latest one-sided game involving Guardiola's side. Such was the gulf in class that City had 83 percent possession and completed 943 passes. They are Premier League records, according to Opta, which started providing statistics for the league in the 2003-04 season. Silva ran onto Sterling's cut-back to bury a low shot into the corner to really get the party started, and then played in Fabian Delph with a delicious through-ball before the left back slid across a center that Sterling tapped in for 2-0. De Bruyne picked up a loose ball and smashed in a rising, angled drive in the 54th for the third goal and the fourth arrived after Sterling was tripped for a penalty. Jesus took over spot-kick duties from Ilkay Gundogan, who scored one last weekend against Tottenham, but saw his effort tipped onto the post, only for Bernardo Silva to tap in the rebound. Jesus did get a goal in the end, heading in the 88th. "It was a joy to watch our fans enjoying our game," Guardiola said. "In football, you always have something to improve, it is never a finished business. And the more wins or goals or records, it helps the players to be focused." Considering the chances created, City could easily have racked up double figures in goals, but settled for five and Guardiola took the opportunity to give some squad players a run-out. Veteran Yaya Toure and teenager Phil Foden came on as substitutes, as did Benjamin Mendy for the France left back's first appearance in nearly seven months after recovering from a ruptured anterior cruciate ligament injury in his right knee. Toure, likely in his last season at City after eight years at the club, set up Jesus with a lofted pass for the last goal. The loss left Swansea four points clear of the relegation zone with four games left. Manager Carlos Carvalhal said the result would have "zero" impact on confidence going into the final few weeks of the season.